Just because it's the holidays does not mean that you need to slack on your workouts. Gym hours may be all over the shop, but that doesn't mean you still can't work out at home. I find workout out during the holidays to be a bit of a struggle. So I've come up with 5 quick but challenging workouts that you can easily fit in, no matter where you are! Maybe you can even convince some family members to join in! Give them a go and let me know what you think. This complete body workout is fast, but you'll be sweating by the end. Sing along to the 12 Days of Christmas or just challenge yourself to keep up with the song. That's probably an unrealistic challenge but if you're super fit, let me know if you were able to keep up! Just like the 12 Days of Christmas, complete each exercise in ascending order then work back down, adding on exercise per round. Congrats! You've survived the 12 Days of Christmas ladder! Congrats! 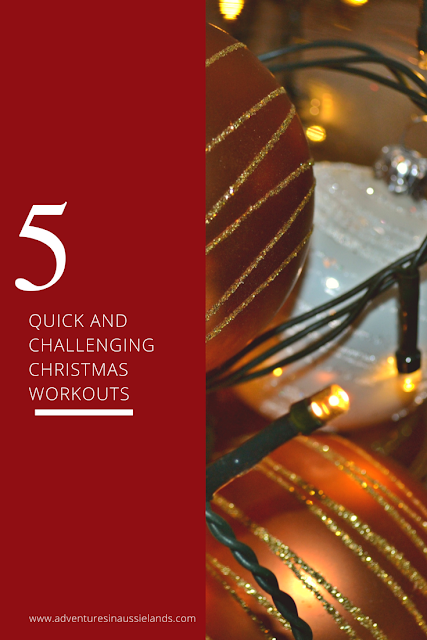 You've made it through the Carols of the Bells workout! I am all about lower body workouts. If I'm ever stuck at the gym, I usually gravitate towards a lower body workout. This year is the year of the booty, so this workout focuses on those booty gains. Feel free to spontaneous start dancing as well because who doesn't want to dance when they hear Feliz Navidad? Remember to go hard for each exercise. You'll be doing 3 exercises, for 30 seconds, with a 10-second rest. Flat stomachs and six packs seem to be what everyone longs for. I may never have a six-pack, but having a strong core is a huge focus of mine. No holiday workout would be complete without a great core workout. For this workout, use your rest period to transition to the next exercise. Don't forget to focus on your breathing and keep your core strong and stable! Woohoo! You did it! Congratulations! For the last Christmas workout, we fit in a little bit of cardio. Every time I hear this song, I can't help but bounce up and down with happiness and joy. This is precisely the type of song you want to listen to while doing a cardio workout. Have fun with this one! And with that, you've finished your Christmas workouts! Great job! Here's to rocking another day of the 12 Days of Blogmas. Wanting a bigger challenge? Try to do these workouts multiple times. That will push you a little bit more and help you finish off the year strong. If you try any of the Christmas workouts, share your thoughts by commenting below or post a picture or video on Instagram or Facebook using #AussielandChristmasWorkouts. Be sure to tag Adventures in Aussieland. I would love to see your photos rocking these workouts! Be sure to stay tuned tomorrow for the next instalment of the 12 Days of Blogmas.